News and tips by and for staff providing reference services at the Newman Library, Baruch College (New York, NY). We’ve fixed the problem reported here on March 21 that was preventing off campus users from going from OneSearch records for ebooks from Business Expert Press to the full text on the iG Library platform. The problem turns out to be that when the database company changed the URLs slightly for all the ebooks in that collection, that new URL syntax was not shared with Ex Libris, which stores them in the SFX knowledgebase that we use to connect users in OneSearch from records to the places where full text is actually found. Thanks to the CUNY Office of Library Services for finding a clever hack to rewrite the ebook URLs in SFX. Next, we’ll work on getting the vendor and Ex Libris to update the URLs in SFX. For now, the hacked solution we have works well enough. Here is a sample record in OneSearch for an ebook on the iG Library platform. 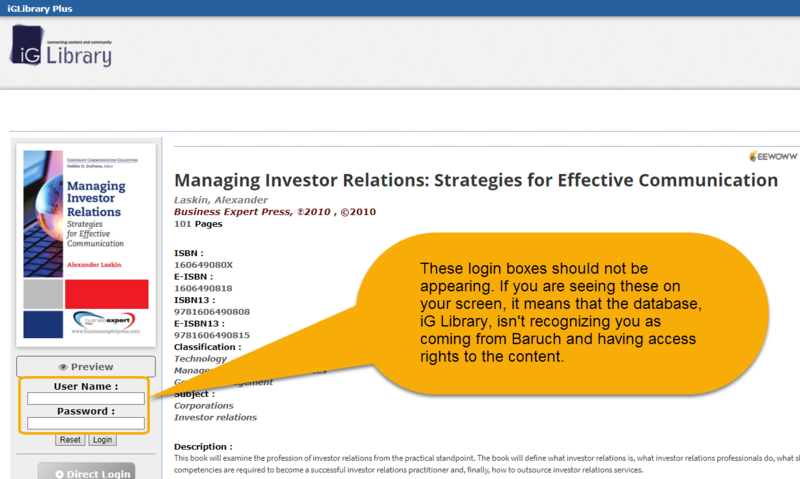 It may take a few days of back and forth with OCLC to find out why our remote authentication system (EZproxy) is failing for this one set of content (records in OneSearch that lead to ebooks from Business Expert Press on the iG Library platform). For now, we can recommend to our users that they use the link for “Business Expert Press” or “iG Library” on the A-Z databases page to go in the front door of the database and then search for the needed title. The problem is fixed (read the details in this post). Some recent changes made by the vendor (American Psychiatric Association) on their end seem to be preventing us (and most other libraries using EZproxy) from connecting to the DSM-5 Library from off campus. On campus access remains unaffected. I’ll update here as soon as the vendor and OCLC (the vendor for EZproxy) sort this out. A change was made by BCTC to the EZproxy server that restored off campus access to Factiva. We’ve lost remote access to Factiva due to some unknown technical problem (the vendor, ProQuest, thinks it may either be an issue that our campus IT can help diagnose or that OCLC, the vendor for EZproxy, can figure out). On campus access to Factiva is working fine, though. 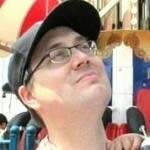 I’ll update this blog when we figure out a fix. Users from off campus can now connect to S&P NetAdvantage again. As I had suspected, the settings from S&P had changed with no notification from them and required me to tinker with the settings in our EZproxy server. On campus access is fine. 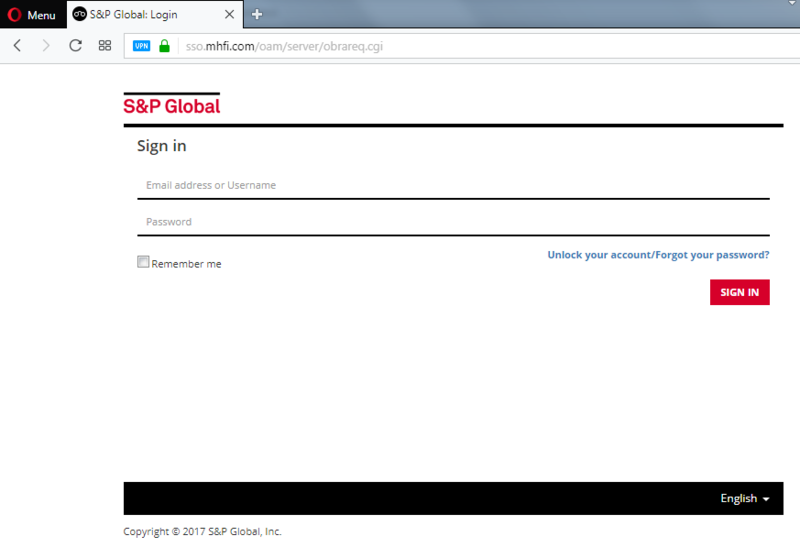 It is likely that S&P once again was fiddling around on the back end of their systems and failed to realize that they’d be breaking remote access for academic customers that use EZproxy software (and that’s most of us colleges and universities) to manage off campus access. I’ll have to fiddle around with the settings in EZproxy for this database to see if I can restore remote access. Look for an update here when that fix is made. As it turned out, Artstor had been doing work on its search system and changed enough things that remote access broke for all libraries using EZproxy. Remote access is now working again. The problems we were seeing with access to ebooks on the new Ebook Central platform should now be gone. Since ProQuest moved CUNY’s ebook collections from the ebrary platform to Ebook Central last Wednesday, we were unable to connect to the full text from off campus. After much back and forth with ProQuest’s tech support staff and after my endless fiddling with the settings file in our EZproxy server that enables off campus access, we were able to get things working again. If there are any ebook access problems you encounter, please report them to Mike Waldman or me. ebrary moved to a new platform EBook Central so it will look different this morning. We are experiencing issues however with remote access. We are working with the vendor to resolve them as quickly as possible. Get email delivery of each post.